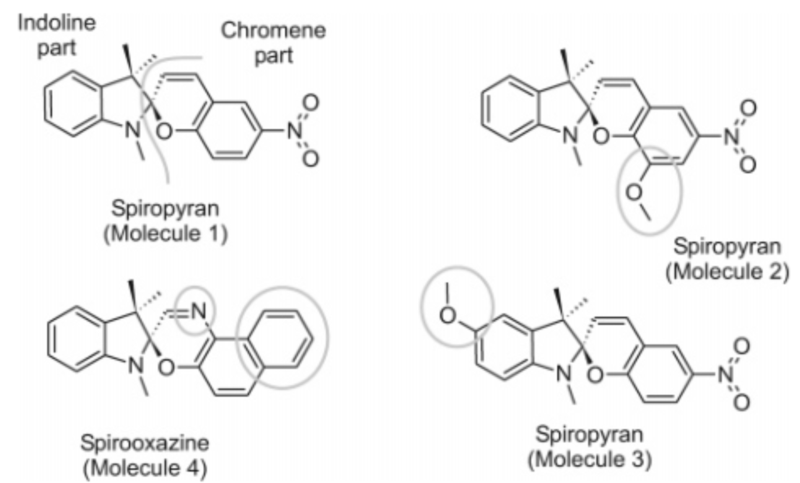 The gas-phase dynamics of two classes of photochromic molecules, three spiropyrans and one spirooxazine, have been investigated here using both time-resolved mass spectrometry and photoelectron spectroscopy approaches. It is, to our knowledge, the first gas-phase experiment done of these kinds of molecules. The molecules are excited at 266 nm and probed at 800 nm. The comparison of the dynamics of these four molecules has been used to propose a sequential photoisomerization mechanism involving four steps occurring in the first 100 ps. Each of these steps is discussed and related to the observed condensed-phase dynamics and to theoretical calculations. This work deals with the photophysics of a pyridinium betaine, 2-pyridin-1-yl-1H-benzimidazole (SBPa), based on a combination of steady-state, femtosecond photoionization (gas phase) and femtosecond transient absorption (solution) spectroscopic measurements, supported by (LR)-PCM-(TD)DFT calculations. 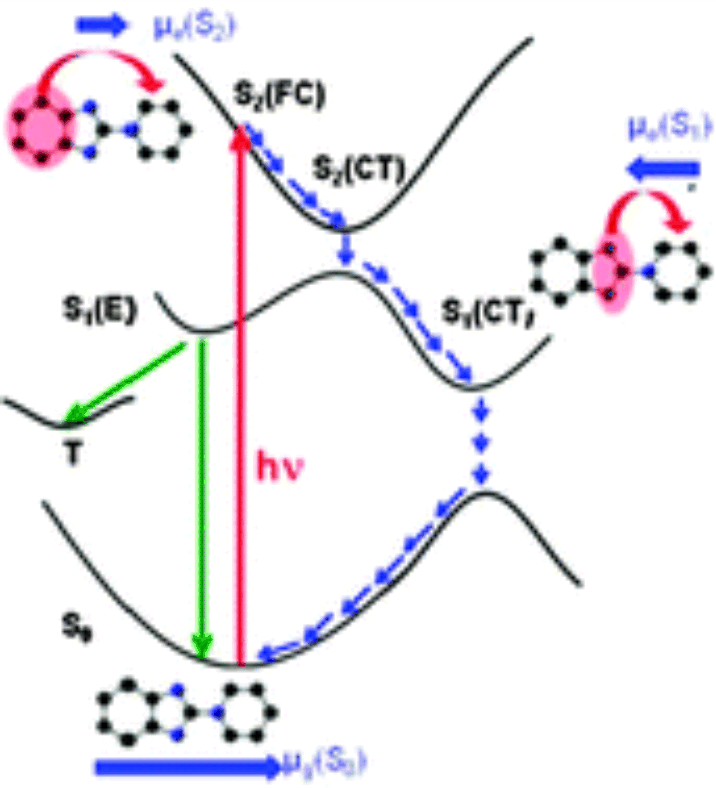 Preliminary and new electrochemical results have revealed a strongly negative solvatochromic charge transfer (CT) absorption due to a S-0 -> S-2 vertical transition and a weakly-solvatochromic emission due to S-1 -> S-0 transition. 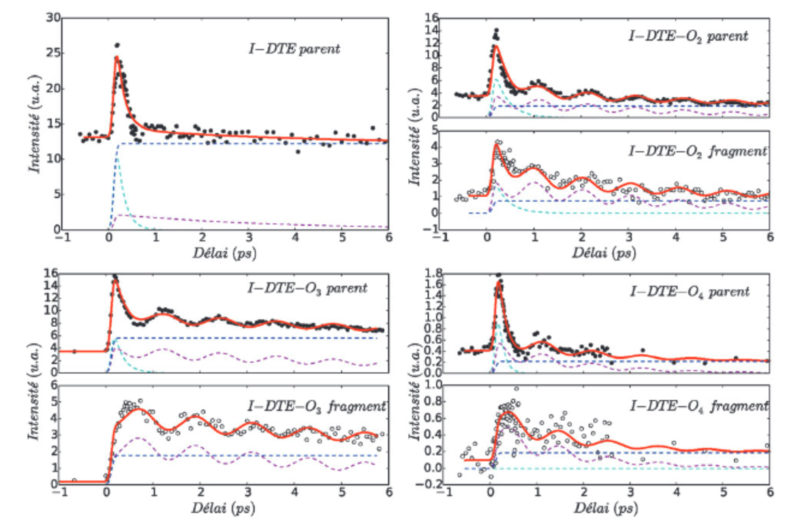 Advanced TDDFT optimizations of the Franck-Condon states S-2(FC) and S-1(FC) led to two additional CT levels with planar geometry, S-2(CT) and S-1(CT), respectively, allowing prediction of a two-step photoinduced ICT process, i.e., S-0 -> S-2(FC) and S-2(CT) -> S-1(CT), separated by a S-2(FC) -> S-2(CT) back charge transfer relaxation. While the pyridinium ring is the acceptor group in both steps, two different donor groups, the benzene ring and the imidazole bridge, are involved in the excitation and internal conversion processes, respectively. Femtosecond transient absorption experiments supported by MCR-ALS decomposition confirmed indeed the contribution of two distinct CT states in the photophysics of SBPa: following excitation to the S-2(CT) state, ultrafast production of the emissive S-1 state (the only channel observable in the gas phase) was observed to occur in competition with a further ICT process toward the S-1(CT) state, with a time constant ranging from 300 fs to 20 ps depending on the solvent. While in aprotic media this ICT process was found to be purely solvent controlled (double polarity and viscosity dependency), in protic solvents, the influence of the hydrogen bond network has to be taken into account. Comparison with data obtained for a pre-twisted SBPa analogue led us to exclude the presence of any large-amplitude geometrical change during ICT. Analyzing the solvent dependency using the power law approach, we concluded that the S-1(CT) state decays essentially through IC in the 3-40 ps time range whereas the emissive S-1 state decays within 130-260 ps via IC, ISC and fluorescence. State-of-the-art experimental and theoretical tools were used to investigate the gas-phase relaxation dynamics of various photoexcited photochromic dithienylethene molecules in situations where several relaxation channels are simultaneously at play. Unconstrained and constrained dynamics were addressed by considering unbridged and bridged molecules with a polyether bridge of various sizes (from 2 to 4 units). Time-resolved ultrafast ionization spectroscopy techniques were used to probe the dynamics. This revealed the existence of several relaxation pathways from the first excited state to the ground-state. Characteristic times were determined for each process. These channels compete at an early stage of the dynamics only when the initial wavepacket splits into two parts. A striking excited state wavepacket oscillation is observed in bridged molecules. A general reaction mechanism is proposed which rationalizes the carbon carbon distance rule which is widely used as an empirical tool to predict the photoactivity of photochromic molecules in crystals.